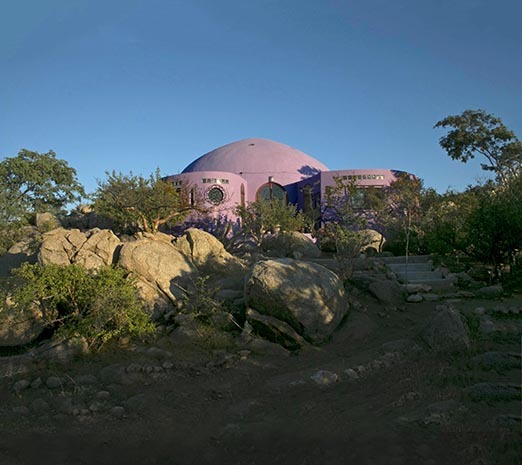 If you love homes that are beautiful, surprising, daring and whimsical, then you will love the Om Dome in Los Zacatitios, East Cape. 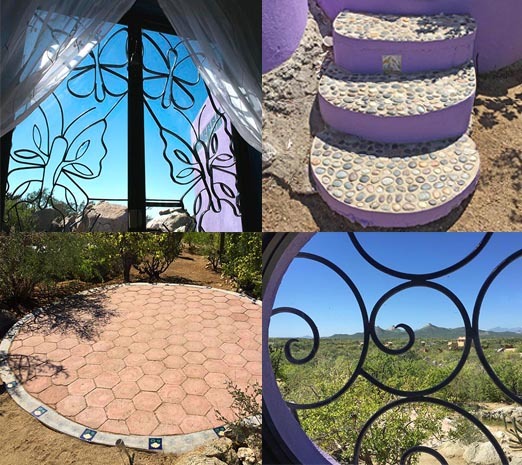 I first heard about the “round, purple, artist’s house” from friends who knew about my search for interesting houses in Los Cabos. 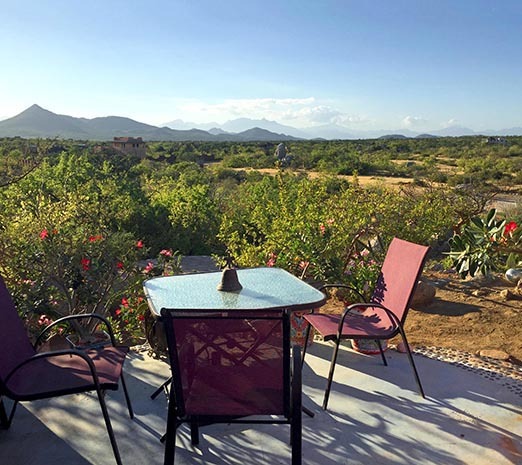 I was not surprised that it was in Zacatitos, an area which, despite being just 11 miles from San Jose del Cabo, was isolated enough to be settled by more adventurous souls attracted to the raw, unspoiled beauty of the East Cape, its laid back lifestyle and sense of freedom. Often, they made homes that reflected this spirit. 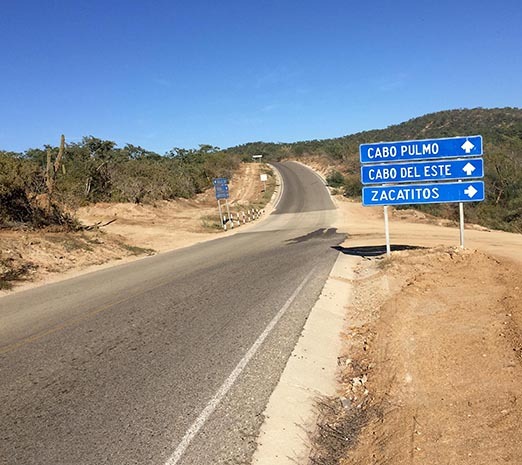 In the old days, the only way to get to Zacatitos was over a bumpy, dirt road that wound its way to the coast. Today, a new paved road has changed everything. You just go over the white bridge that takes you out of old San Jose, past La Playita, Puerto Los Cabos and La Laguna, until you see the sign for Zac’s Bar and Grill. And there you are. Turn right and follow the path. The arrival of big developments to the East Cape has brought an air of excitement and expectation to the area. I am happy to say, however, that despite these changes, Zacatitos still holds its essential charm. 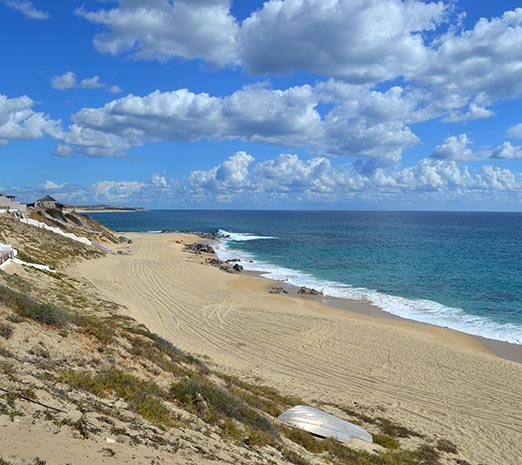 The community continues to live off the grid and close to nature, its beautiful beaches remain private and unspoiled, and its sky, big, wide and blue. To the right are twin, pointy shaped mountains that mark Punta Gorda next door. We filmed there once, right after the rainy season when the hills were fresh and alive with new growth. It was so green, it could have been the Shire. And butterflies were everywhere- Monarchs on their migration. The sand was white and the sea was blue. It was glorious. 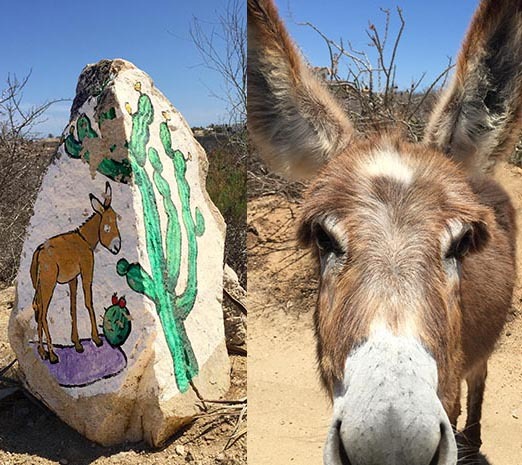 You have to love a place whose only signs are painted on rocks. And if you are lucky, the wild burros will come to your car to say hello. 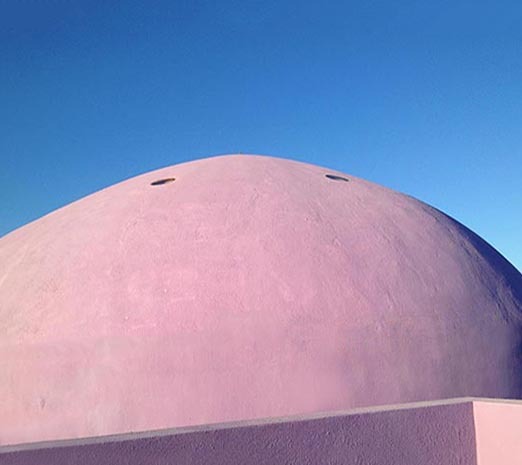 The Om Dome’s unique shape and color are perfect against this setting. From a distance, it can seem exotic and mysterious, tucked on its low, rocky hill. With those twin mountains in the distance and that gorgeous desert landscape, it has a romantic, Moorish feel. 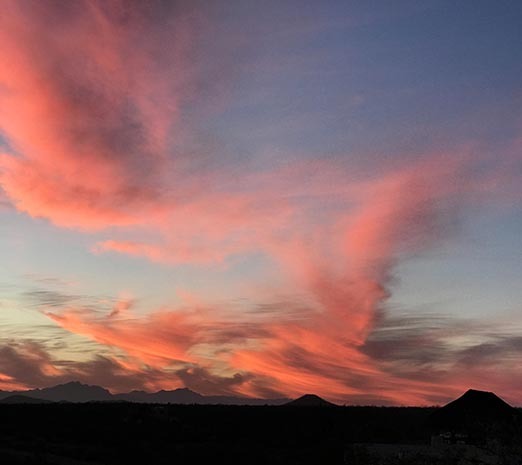 Then, when those amazing Baja sunsets take over and the sky is a brilliant swath of pink and orange, you are struck by the Dome’s majesty and drama. 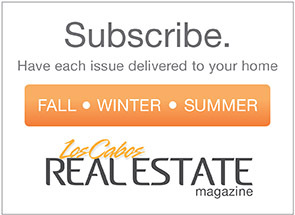 A fanciful and amusing sentiment, since I don’t think there was ever a need for a mailbox- there is no home mail delivery in Los Cabos. 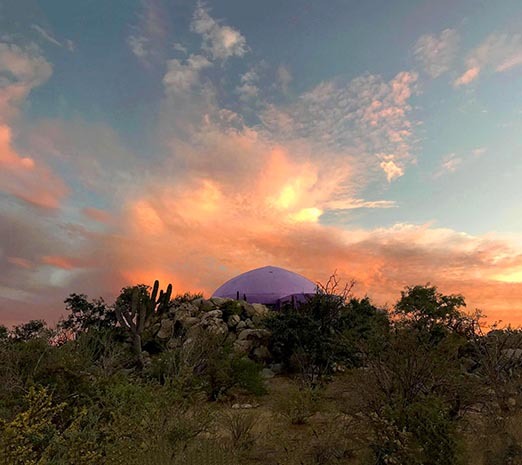 The Dome is very much a reflection of its creator, the holographic artist and photographer Roberta Booth, a beautiful, soft-spoken and adventurous woman who came to Zacatitos 20 years ago. A modeling career took her first to Europe and then Majorca, where she lived before returning to California. 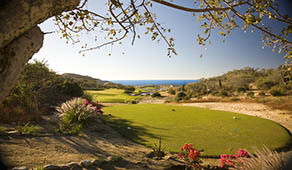 Once back in the States, however, she found herself missing Majorca. An artist friend suggested Cabo as a closer alternative. But Roberta wasn’t too keen- she had been before on a photo shoot, and didn’t like it. To which her friend replied, “You haven’t seen the East Cape!” It turns out the friend was right. 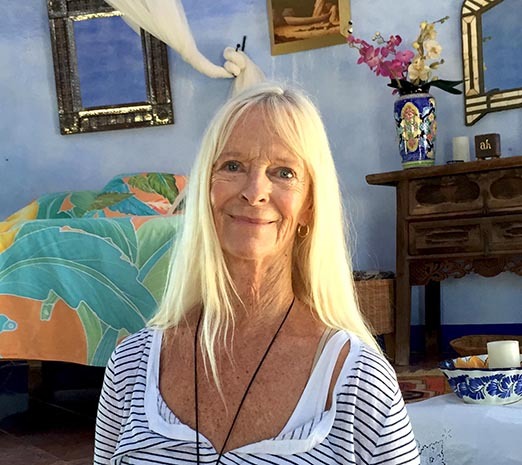 Roberta loved the area and decided on that first visit to build an art studio. 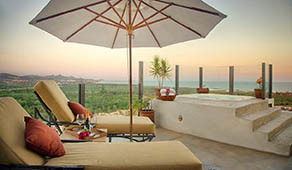 This led to the one acre lot in Los Zacatitos, chosen for its views and magnificent rock formations. 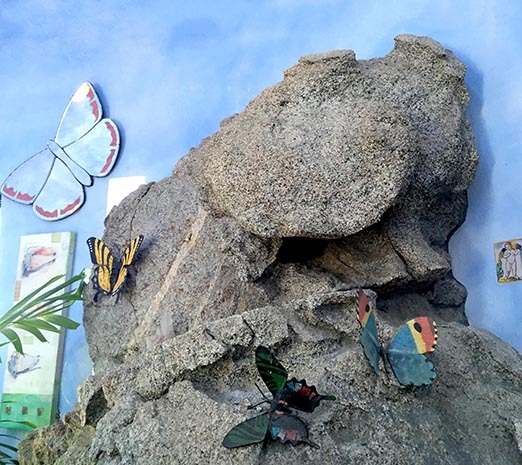 Roberta loved those rocks so much that she resolved not to disturb them, but to incorporate them if necessary into her home. 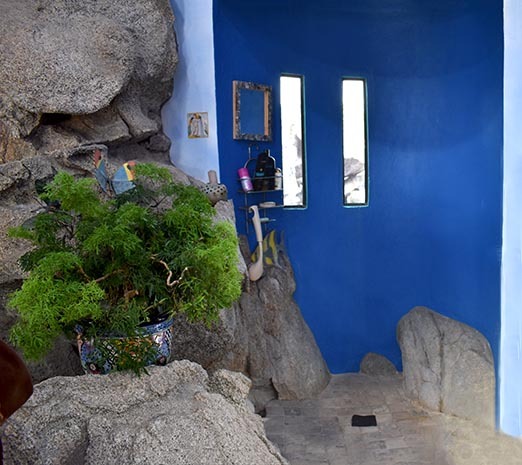 This is a cool feature also common to houses in Pedregal, which I covered in a previous article. I really like Roberta’s gutsy, right-brained approach to the construction process. 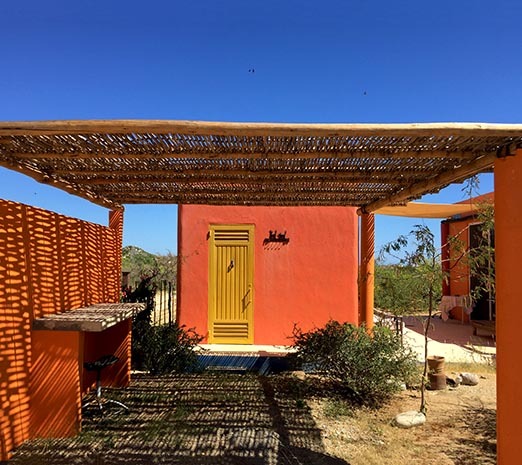 She had visualized her completed home, but had no practical resources- no training, no building experience, no architect, no architectural plans. Nor were there any precise measurements. 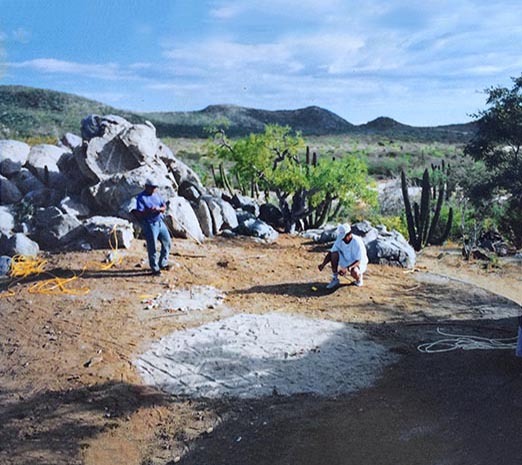 When it was time to break ground, Roberta simply estimated what seemed like the right height and size for a house and drew a circle in the ground. If the line hit a rock, the rock became part of the house. 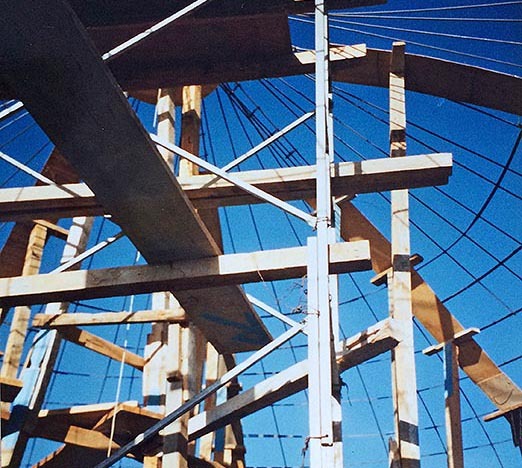 While its construction may have been intuitive and improvisational, the design of the Dome shows considerable forethought, revealing an artist’s fascination with light. 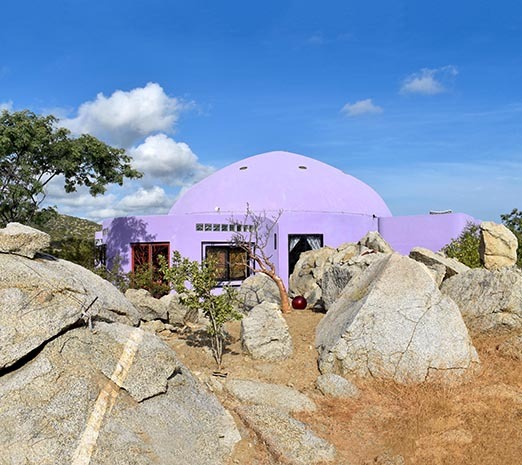 For example, the color of the Dome, Roberta was quick to tell me, is not purple, but violet, a pure color with the highest vibration on the color spectrum and which corresponds to the 7th chakra, the Crown Chakra, associated with transcendence and the divine. At the tip of the dome is a big round skylight surrounded by 8 smaller portholes, like the planets around the sun. 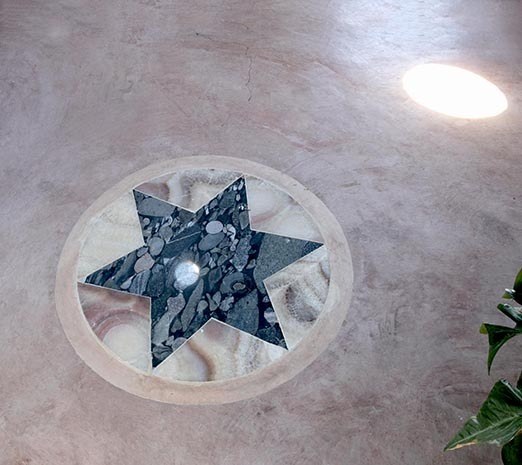 At the center of the Dome, on the floor directly below the skylight, is a star made of Brazil stone embedded with fossils and other interesting things. The two points line up to form a direct channel for the flow of energy and light. 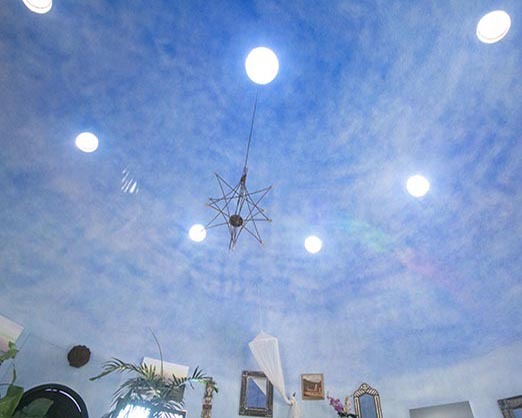 Continuing the celestial theme, the interior is painted a lovely sky blue. The entire home is oriented to follow the sun as it moves across the sky. The front door faces east and the ocean. Directly opposite, the back door faces west and the mountains. At certain times of day, the sun shining through the portholes casts circles of light in the room. At night, a laser projection creates a three dimensional sky with stars like a planetarium. You are in a spaceship, drifting through the cosmos. Even without the symbolism, the Dome is a great space. The first impression when you enter is an amazing sense of peace and calm, an almost spiritual vibe. There are soft chimes and patterns of light playing across the room. I am not sure how it happens, but sometimes there are even little rainbows. It is basically one large, circular space, around 32 feet in diameter and 21 feet high. Two low, facing rock walls create a little pathway into the room. The Dome takes the open floor plan idea a step further by doing away with walls altogether. The bed is on a raised platform, separating it from the rest of the living area. You can wake up in the morning and check it all out below from under the covers. 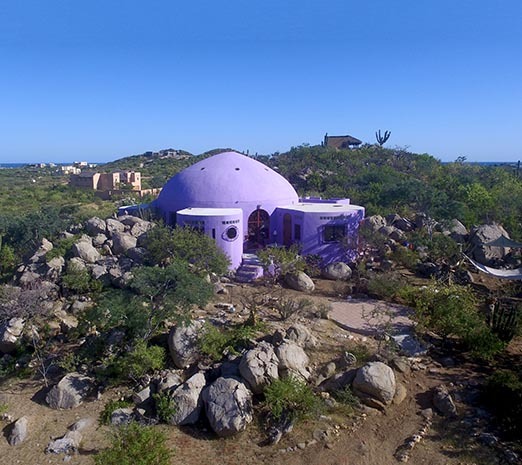 Leading off from the circle are a kitchen, bathroom and guest room, not part of the original design and added only after Dome construction had begun. To the right of the entrance is an interesting cluster of large rocks embedded in the wall, some of the original ones from the site. One of this cluster makes up part of a little shower niche. 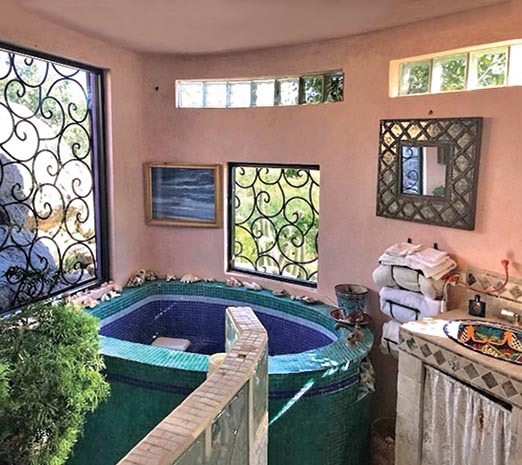 Next to the shower, the bathroom has a fun boat shaped tub, and windows which are cleverly shielded for privacy by large boulders outside. Furniture is artfully arranged to create separate spaces within the larger space- a dining area, lounge areas, work area. This eclectic collection reflects Roberta’s many travels including Africa, Asia, Europe, Indonesia and Tibet. Overall, the Dome is a dreamy, feminine space, all curves, circles and rounds. Even the security grills on the windows, designed by Roberta, are curly. Butterflies, birds and stars are common decorative motifs. The charming back patio is perfectly situated to catch those brilliant sunsets over the Punta Gorda mountains. The patio floor, decorated with stars, has faded into a pretty pale blue, the color of the sky. Round steps take you down to a lower, circular patio area and then on to a lovely desert garden, tumbled with rocks, flowers, trees and special objects placed by Roberta herself- gazing balls, a selenite crystal for communicating with angels, an illuminated turtle and a smiling lizard carved from a stick, sunning themselves on the rocks. Birds swoop overhead and call out from the cactus. 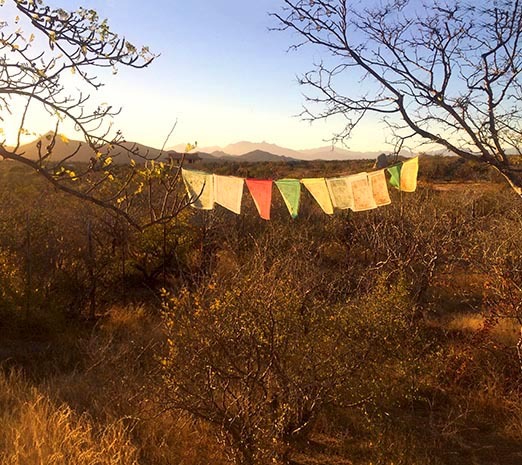 There is a white hammock and Tibetan prayer flags fluttering in the breeze. If a fairy should peek out from the flowers, I would not be surprised. 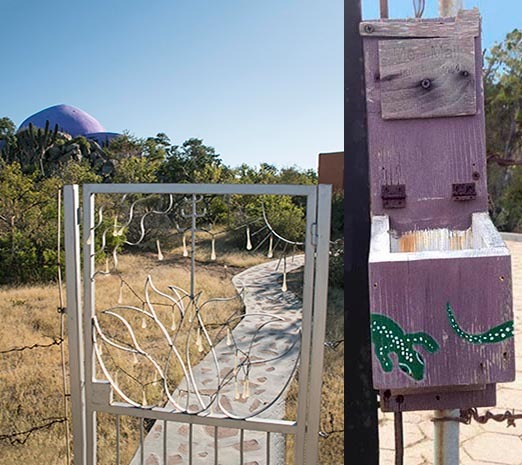 About 50 feet from the Dome is Roberta’s art studio, the Desert Light Gallery. 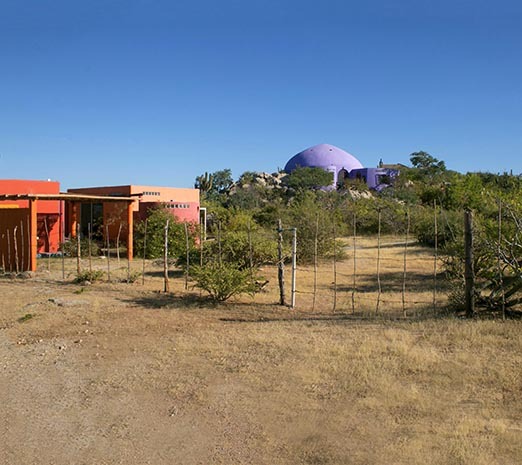 It consists of 2 orange colored cubes connected by a shared patio, making a graphic contrast to the roundness of the main house. 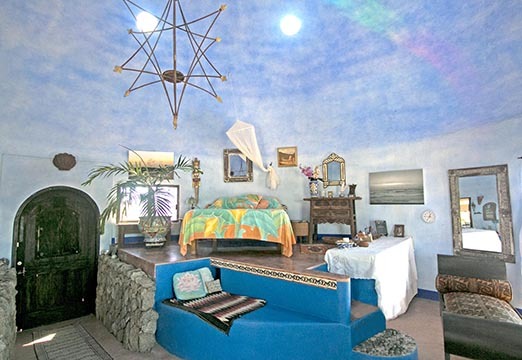 Over time, these rooms have served as an art gallery, a self-contained guest quarters, as well as Roberta’s studio, where she makes jewelry and works on her latest art series inspired by the sea and the sky. The Om Dome is a great adventure story about love, imagination and audacity. It is one of those unique architectural gems I love about Los Cabos. 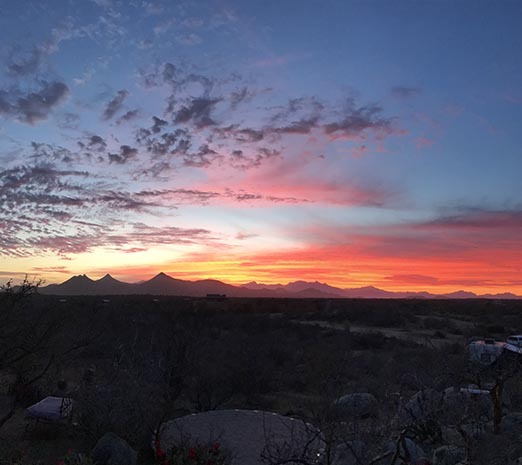 Whenever there is an especially beautiful sunset in Cabo, I think about it, and wonder how it must be in Zacatitos at that moment, with that marvelous, voluminous shape silhouetted against an amazing East Cape sky. If you are interested in East Cape properties, click here.